VX73001 EDDY, HETHERINGTON MARTIN. Submitted by Cary Sandell. Member of the 2/2nd Younger Generation Group. Jungle 10 count - 15 August 2005. On the 50th anniversary of the defeat of Japan, an old Digger brought in to the Warrnambool Standard a poem about Mick Eddy, a soldier in the 2/2nd Pioneers. Mick had been a handy pug at the old West Melbourne Stadium around 1939-40. On the road to Lae he was chopped to bits by Japanese bullets. My newspaper story read: "The 10-count from which no man rises was tolled over him in New Guinea jungles." 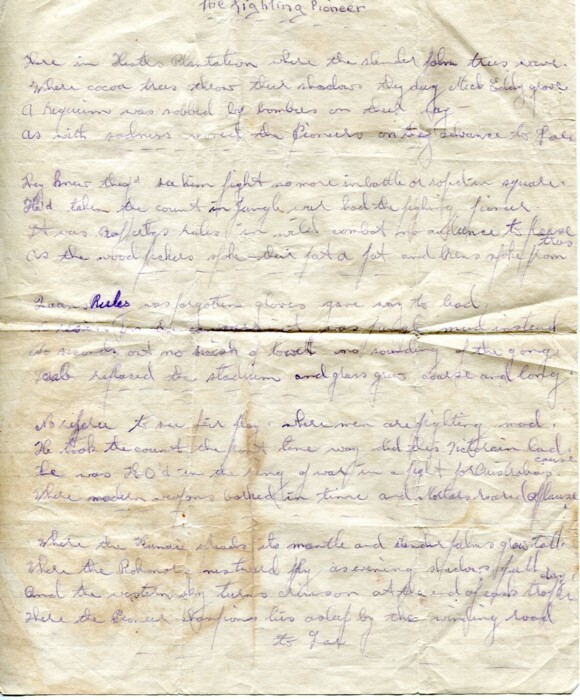 The poem, The Fighting Pioneer was unsigned. Today brings the 60th anniversary of VJ Day, Victory over Japan (Forget VP, Victory Pacific. The enemy was not an Ocean). A day to publish in FIGHTER this tribute to a forgotten prelim fighter. P. CONNELLY, Warrnambool, VIC. As with sadness moved the Pioneers to Lae. And the Brens spat from the trees. Scrub replaced the stadium and grass grew coarse and long. Where maddened weapons sounded time and mortars barked applause. The Pioneer champion lies asleep on the winding road to Lae.